A reminder of the 2008 International Conference on Climate Change as you won't probably find it in the regular news media. Often, these scholars have been ignored, and often even censored and demonized. They have been labeled â€œskepticsâ€� and even â€œglobal warming deniers,â€� a mean-spirited attempt to lump them together with Holocaust deniers. The truth of the matter is that these scholars dissent from a false â€œconsensusâ€� put forward by a small but politically powerful clique of government scientists and political allies. Some of the presenting speakers appear to be on the fringe themselves. Whilst they may be affiliated with institutions that do not have institutional bias, the individuals themselves (ex: Robert Bailing) have a long association (over ten years) with the Heartland Institute, which is sponsoring the conference and which may well provide grants for these scientists. Will you attend the conference? Several obscure news articles indicate that the expected attendance will be several hundred people. Unsurprising that the conference is not receiving much news coverage (altho there is some) as even the annual AGU conference, which attracts upwards of 15,000 scientists, rarely makes much by way of headlines. Many who study climate are far less extreme in their views on changing climate than the media portrays the situation. However, this reflects the cautious nature of scientists, not the uncertainty wrt climate change and the potential for far-reaching effects. It is this same cautious nature at the root of the precautionary principle, and which hesitates to embrace anything sponsored by the Heartland Institute. As to scepticism on the topics being presented: Any opportunity to develop new technologies is an opportunity for economic growth. To argue that reducing fossil fuel use (through development of alternative technology) is economically disastrous, is a bit much to swallow. OTOH, there is general agreement that draconian capping measures would be harmful to economic growth, which is likely why such measures have not happened to any great extent. Your implication that this conference represents unbiased science seems off the mark, old chap. Let's look at the address line again, yes this place is really called "The science forum" which suggests that science is discussed. Science is about ideas, hypotheses and theories, proof and falsification, but above all about curiosity. What is going on and why? So what do we see? a couple of post purely about fallacies. Discussing people, who actually have been seen to fill up their cars with gas, so they are crooks so they are wrong. Ad hominems. So perhaps we should try and behave as curious scientists instead of a consensus herd and discuss the idea that climate change may be different when we study the Independent Summary of Policy makers, written by scientists, not politically correct computer modellers. The Earth's climate is an extremely complex system and we must not understate the difficulties involved in analyzing it. Despite the many data limitations and uncertainties, knowledge of the climate system continues to advance based on improved and expanding data sets and improved understanding of meteorological and oceanographic mechanisms. The available data over the past century can be interpreted within the framework of a variety of hypotheses as to cause and mechanisms for the measured changes. The hypothesis that greenhouse gas emissions have produced or are capable of producing a significant warming of the Earths climate since the start of the industrial era is credible, and merits continued attention. However, the hypothesis cannot be proven by formal theoretical arguments, and the available data allow the hypothesis to be credibly disputed. Arguments for the hypothesis rely on computer simulations, which can never be decisive as supporting evidence. The computer models in use are not, by necessity, direct calculations of all basic physics but rely upon empirical approximations for many of the smaller scale processes of the oceans and atmosphere. They are tuned to produce a credible simulation of current global climate statistics, but this does not guarantee reliability in future climate regimes. And there are enough degrees of freedom in tunable models that simulations cannot serve as supporting evidence for any one tuning scheme, such as that associated with a strong effect from greenhouse gases. The available data over the past century can be interpreted within the framework of a variety of hypotheses as to cause and mechanisms for the measured changes. The hypothesis that greenhouse gas emissions have produced or are capable of producing a significant warming of the Earthâ€™s climate since the start of the industrial era is credible, and merits continued attention. However, the hypothesis cannot be proven by formal theoretical arguments, and the available data allow the hypothesis to be credibly disputed. 'Twould seem you've missed the point of the preceeding posts. Science may be about ideas, including the idea that the oil company likes to sell oil, but it is also about identifying bias in order to analyse results properly. Your conference appears biased. Will you be attending? The International Conference on Climate Change will take place at the Marriott Marquis Times Square Hotel, 1535 Broadway, in the Theater District of Midtown Manhattan. The purpose of the conference is to generate international media attention to the fact that many scientists believe forecasts of rapid warming and catastrophic events are not supported by sound science, and that expensive campaigns to reduce greenhouse gas emissions are not necessary or cost-effective. The purpose of scientific conferences is to discuss science. The purpose of PR events is to generate media attention. 2: Rationalising warnings that might challenge the group's assumptions. 4. Stereotyping those who are opposed to the group as weak, evil, disfigured, impotent, or stupid. ...Some of the presenting speakers appear to be on the fringe themselves. Whilst they may be affiliated with institutions that do not have institutional bias, the individuals themselves (ex: Robert Bailing) have a long association (over ten years) with the Heartland Institute, which is sponsoring the conference and which may well provide grants for these scientists. Mindguards â€” self-appointed members who shield the group from dissenting information. 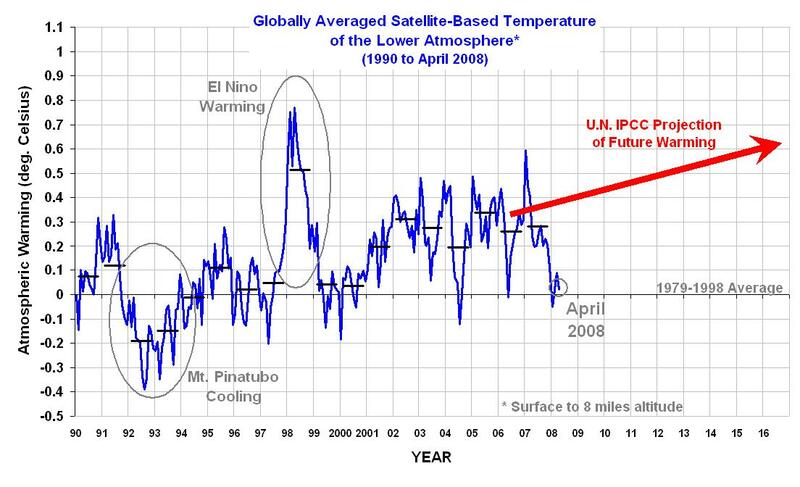 Any idea why this graph is never shown in any global warming session? Now are you going to find out why Roy Spencer thinks that global warming is highly exagarated or are you going to try and make him mankinds worst enemy? Indeed, Andre, you appear to be tilting at windmills. Well it never ceases to amaze me that if somebody claims that one and one is two, that instead of checking the calculation, it is investigated if the claimer is a crook or not and if so then automatically one and one is not two. Yes I'm literally don quixotting against windmills. There is no choice, can't sit idle and see how humanity is facing heavy hardship, due to some alarmist groupthink. I must do what I can to fight that, successfully or not. 1. All his statements are simply assertions of disbelief regarding what other climatologists say. He says that their claims are articles of faith, and then goes on to say "I believe..." regarding every one of his claims. 2. He pulls a lot of data from sources/research bodies that are funded by industry. The whole cigarette=harm issue has taught us to beware of these bodies and the results they produce. 3. His preferred explanation, regarding precipitation systems, is not an explanation at all, regardless of the amount of peer reviews he throws at it. He does not take into account all the factors that affect precipitation, but takes it as a given, in a Gaia sense a self-correcting mechanism. Yet he gives no satisfactory reason for why he believes this. If this is his credo and he wants to be Don Quixote, that's fine. But he needs a bit more intellectual weight (as opposed to lots of graphs, many of dubious provenance) if he wants his arguments to be taken seriously. However with this demonstration of non-refutability (whatever happens global warming remains true), global warming no longer belongs to the realm of science. Modern science is politics, it would seem, and soundbites ("QED" etc) rule. I think Dawkins (sorry I'm getting memetic again) points out that mem-plexes include defence mechanisms that preclude the possibility of their being questioned. Even if my objections conform entirely to logic and empiricism, a denier of anthropogenic global warming will always see them not as refutation but as excuses or rationalisations. "These things happen, Malini" (as the line went from a play I did many years in the past). Probably how I want it to see. All I see is a declaration -based on wishfull thinking- that Spencer is wrong. And happy oh yes for the groupthinkers of course he is wrong. No need to examine anything, Just the observation that he opposes the aggressive focal "main stream", which just sounds the loudest, especially about demonizing the opposition. How about debunking the ISPM? Or the stable character of the atmosphere revealing no positive feedback so desperately required to get the enhanced greenhouse effect? The ISPM does not need debunking. In relatively calm tones they point out that we cannot be 100% certain of the issues. This is correct. They do not refute the notion of anthropogenic climate change - merely point out that there is some uncertainty. Fair enough. There is no compelling evidence that dangerous or unprecedented changes are underway. BUT...everything this else in the climate system probably WON'T stay the same! For instance, clouds, water vapor, and precipition systems can all be expected to respond to the warming tendency in some way, which could either amplify or reduce the manmade warming. These other changes are called "feedbacks", and they determine whether manmade global warming will be catastrophic, or barely noticiable. Feedbacks are the source of almost ALL SCIENTIFIC DISAGREEMENTS over global warming. Anybody disagrees or want to show where this is refuted? Almost all of the scientific uncertainty about the size of manmade global warming is related to how the climate system will respond the small (1 deg. F) warming tendency. The atmosphere could dampen the warming tendency through 'negative feedbacks'-- for instance by increasing low-level cloudiness. Or, it could amplify the warming tendency through 'positive feedbacks', for instance by increasing the water vapor content of the atmosphere (our main greenhouse gas), or by increasing high-altitude cloudiness. Almost all computerized climate models exhibit positive feedbacks, amplifying the initial CO2-only warming by anywhere from a little bit, to a frightening amount (over 10 deg. F by 2100). So, you can see it is critical for scientists to determine how sensitive the climate system is (how the atmosphere will respond) to the radiative forcing from the extra greenhouse gases we are putting into the atmosphere. The reason must ultimately be related to precipitation processes. I believe that precipitation systems act as a thermostat, reducing the Earth's greenhouse effect (and thus causing enhanced cooling) when temperatures get too high, and warming when temperatures get too low. It is amazing to think that the ways in which tiny water droplets and ice particles combine in clouds to form rain and snow could determine the course of global warming, but this might well be the case. I believe that it is the inadequate handling of precipitation systems -- specifically, how they adjust atmospheric moisture contents during changes in temperature -- that is the reason for climate model predictions of excessive warming from increasing greenhouse gas emissions. To believe otherwise is to have faith that climate models are sufficiently advanced to contain all of the important processes that control the Earth's natural greenhouse effect. For ballpark figures, from slide 6 here. let's assume average annual evaporation of a meter per year. That's 2.74 liters (2740 g) per m2 per day or 114 g per hour is 0.032 gram per second. It takes 2500 joule to evaporate one gram of water, so for 0.032 gram that's 79 joule per second per square meter or 79 W/m2. Now to keep relative humidity constant when increasing the ambient temperature of 15 C to 16 C, suppose a dewpoint of about 9 degrees we see here a decrease of 67% to 63%. Obviously we also have to raise the dewpoint one degree to get back to 67% Now the absolute humidity calculated here goes from 9 gram/m3 at a dewpoint of 9 degrees to 9.6 gram/m3 at a dewpoint of 10 degrees, an increase of 7%. To sustain an increase of 7% more water vapor in the atmospere it seems logical that the rate of evaporation also has to increase by 7% as well, which in turn requires 7% more energy. Hence I'd need 7% of 79 W/m2 or 5.5 W/m2 extra to maintain constant relative humidity. However the estimated increase in energy for doubling C2 ranges from 3.4 to 4 W/m2. So the available increase in energy is unable to provide both warming and maintain constant relative humidity required for positive feedback. In fact it is consistent with the assessment of Spencer that the precipitation cycle acts as a formidable negative feedback to warming which is also also demonstrated by KÃ¤rner in my earlier links. Now, where exactly is that debunked? 1. I have no problem with the first two quotes. The third one (which I have re-quoted - demonstrates my point about Spencer's credo: "I believe"
2. Ballpark figures are inadequate - particularly the way in which you're using them because we cannot use simply the calculation of the amount of radiation 'hitting' the earht - we have to factor in, at the very least average albedo and its changes - when white ice changes to dark sea water, for instance, absoprtion, and overall increase in temperature from the same sunlight will increase. c. Constant shifting of the point of attack until you finally find the god-of-the-gaps to your satisfaction. I'd really like it if your arguments held water - I for one could breathe a sigh of relief regarding an issue that has troubled me these 20 years and more - but you haven't made a good case here. 1. ..... demonstrates my point about Spencer's credo: "I believe"
In most fields of science, researchers who express the most self-doubt and who understate their conclusions are the ones that are most respected. Baloney. More than adequate to demonstrate that a certain mechanism cannot work, especially when figures are used at the best possible advantage. We know the range of increased IR back radiation (HITRAN/ MODTRAN) and if we can demonstrate that it's not even adequate to sustain constant humidity under moderate (favorite) conditions. Under tropical conditions for instance the Clausius Clappeyron relationship demonstrates that the energy required for constant humity, increases exponential. Your albedo, etc talk demonstrates that you have no clue what is all about. it's not my problem if you have no idea what science is about. The others can just follow the links and verify data and methods. So you learned a new word. Ad hominem, Cool, Now it's also better to know what it means and even better to recognise where it is used. Please do indicate where I did use an ad hominem. Forgive me for being a bit dim today, but I couldnâ€™t follow your calculation, and Iâ€™ve done one of my own that comes up with a vastly different result. Please show me where Iâ€™m going wrong. Thanks in advance. At 60% RH and 14 deg C air contains 5.9681 grams of water per kg of dry air, and at 16 deg C it goes up to 6.7977 g/kg. The increase for a 2 deg C dry bulb temperature rise is therefore 0.8296 g/kg dry air. For a 1 deg C rise we can use half of this, 0.4148 g/kg. The height of the troposphere is approximately 11,000 m, so a 1 square metre area on the surface is sitting under 11,000 m3 of air. The density at sea level is around 1.17 kg/m3 and at the top of the troposphere itâ€™s much less, so letâ€™s assume for now that the average density is 1 kg/m3 (feel free to correct if you have a better value here). Thus the mass of air in our 11,000 m column is 11,000 kg. The water added by a 1 deg C temperature rise is therefore 11,000 x 0.4148 g = 4,563 g.
The latent heat of vaporization is approx. 2500 joule/g (Iâ€™ll use you figure, close enough). Therefore the heat required to evaporate all this water is 2500 x 4563 = 11.4 x 10^6 joules. This is for a column sitting on 1 square metre of surface, so this is the same as the joules per square metre required to evaporate the water for a 1 deg C temperature rise. Now we need to consider time. A 1 deg C rise is expected to occur over a period of what? Ten years, or twenty â€“ I canâ€™t really recall, but letâ€™s assume itâ€™s ten years. Ten years is 315,000,000 seconds so the average rate of heat transfer needed to evaporate that water is 11.4/315 = 0.032 joules/s, or 0.032 watts per square metre of surface. Your result of 5.5 w/m2 is 172 times bigger than my 0.032 w/m2. Whatâ€™s wrong? it seems that in your example the water vapor stays evaporated indefinitely while in my example I assume dynamic equilibrium between evaporation, condensation and precipitation, to be linear with the increase of absolute humidity and to approximate that I assume the rate of evaporation (g/sec) to go up with the same ratio to cover the loss at the other end of the cycle. The basic assumption that I suppose we both agree on is constant relative humidity (averaged over the planet of course). Taking this as a given, as a baseline in effect, any additional evaporation of water that would upset this constant is precipitated out in short order, as rain, snow. The latent heat absorbed to evaporate this extra water is given up as latent heat of condensation, so the balance is maintained without need for additional heat flux. let me try to clarify this further. Now if you understand the trick you can play with the scenario's and numbers to see that it's always about 0.7-1 degree sensitivity for doubling. And you see that David Archer of realclimate, the ingroup core, is maintaining that site, so there is no use in an attempt to demonize him. He is a warmer. So it seems that we all agree on this. So we need enhancement of that figure to get the scary IPCC scenarios. That's where the positive feedback kicks in and this is essential. No positive feedback, no scary scenarios. Simple as that. So, since water vapor is a much more potent greenhouse gas, there is the idea that the increase of evaporation bringing more water vapor in the air is the primary self sustained positive feedback effect. So doubling CO2 under constant relative humidity brings us to the minimum IPCC scenario. So all I did here is showing that even maintaining constant relative humidity requires much more energy than is provided by the increased back radiation of CO2. Now under these tropical conditions the required energy for constant humidity rises exponential compared to the moderate balpark figures I used. I say that we have several independent ways of proof that there is no nett positive feedback. This is one of them. KÃ¤rner provided a second by showing that the random walk characteristics did not shown the persistence reaction that comes with positive feedback. I will demonstrate later that the combined records of the last glacial terminations also refute positive feedback. To sustain an increase of 7% more water vapor in the atmospere it seems logical that the rate of evaporation also has to increase by 7% as well, which in turn requires 7% more energy. Hence I'd need 7% of 79 W/m2 or 5.5 W/m2 extra to maintain constant relative humidity. No. To increase the water content of the atmosphere by 7% requires only the evaporation of a mass equal to 7% of the existing tropospheric water content, not 7% of the total evaporation from the sea. I did this calculation above. It's simple psychrometry, and we don't need to consider CO2 at all to understand this piece. The rest of your post changes the subject and I won't address it except to mention that I have no intention of demonizing anyone, and there is no groupthink going on here, so drop the little jibes and ad hominems please and stick to the science. Replace the atmosphere with bucket with a hole in it. The precipitation cycle is represented by a constant stream of water, filling the bucket (evaporation) while the water drains through the hole (precipitation), but filling and draining is in equlibrium and the water content of the bucket is 100. What to do to increase the water level to 107? If we poor in 7 water units, the level increases, certainly, but this also increases the pressure which increases the draining rate until equilibrium is reestablished. We need to increase the constant stream to increase the water level with an equal ratio. But you could argue that increasing the temperature is effectively increasing the capacity of the atmosphere to hold water vapor and the analogy with the bucket would be to decrease the size of the hole, decreasing the drainage, so that the constant stream increases the water level until a new equilibrium. The problem with the atmosphere is that the absolute water vapor content with height decreases rapidly, an increase of water vapor at the lowest level would hypethetically, with the greenhouse gas idea, cause the largest increase in temperature also at the lower levels. Hence the lapse rate increases hence the convection rate increases, speeding up the precipitation cycle, which removes the excess water vapor content again. Note also that the increase in latent heat, released with the increased condensation at the higher levels in the atmosphere, emit the energy at IR water- frequencies, which is not absorbed and reradiated by CO2. Hence the excess energy can escape regardless of the CO2 concentration. This is Spencers air conditioner. The demonizing remark was aimed at sunshinewarrio and MarnixR who seem to have this dispicable habit. Actually I have read that the lapse rate decreases with increasing temperature, a claim supported by observation, and not derived from models. The melting icecaps are more realistic evidence of GW than the measurement of surface temperatures. The reason the ST's are more stable is because the replenishment of cold air coming down from above that is replacing the surface air. So the warm air rises to the top. So this air from above is what is melting the icecaps to contribute to the GW problem. And this is real evidence of GW. The biggest source of this GW problem is the DEforestation of our forests that are our 'natural air conditioners'. Besides refreshing the air from CO2 to just oxygen, the trees also COOL the planet by transforming all the Suns light into GROWTH, rather that reradiating heat as the deserts do. GW is a real problem. We may be witnessing the beginning of a Heinrich event, generally not associated with warming. Warm air as well as infra red do not do very well for melting snow. Just notice after the winter, where the snow disappears first and where it remains the longest, up to weeks later in the permanent shadow, where both the air temperature and the background IR radiation are the same as in the sun. If it was warming and the convection rate was increased, Greenland and Artarctica warming say some 10 degrees from -50 to -40 would be able to accumulate a lot more snow. Even if it was it does not proof anything about the cause. No deforestation is a real problem. Well, I say that CO2 excesses, deforestation and the melting ice caps are convincing enough for me. Let me clarify my last post on page 2. When I said the heat rises to the top of the atmosphere to keep the surface temperature somewhat uniform, I did not explain how that heat at the top of the atmosphere causes the melting of the ice caps. Well, when this warmer air rises to the top of the atmosphere from all parts of the Earths surface air, it gets back down at the polar icecaps to displace and cool the surface air that spreads out from these polar regions to maintain a uniform temperature at the surface. So this upper sutface air at the top of our planet now is much warmer because of GW than it normally would be if the surface air was not increased because of the excess CO2 and deforestation. So this increased hotter air from above descends at the polar caps to cause the excessive melting. Nice try but it seems to be a wee bit different. The Hadley cell is a circulation pattern that dominates the tropical atmosphere, with rising motion near the equator, poleward flow 10-15 kilometers above the surface, descending motion in the subtropics, and equatorward flow near the surface. This circulation is intimately related to the trade winds, tropical rainbelts, subtropical deserts and the jet streams. The major driving force of atmospheric circulation is solar heating, which on average is largest near the equator and smallest at the poles. The atmospheric circulation transports energy polewards, thus reducing the resulting equator-to-pole temperature contrast. The mechanisms by which this is accomplished differ in tropical and extratropical latitudes. So if the convection around the equator gets stronger due to more warming, it transports the heat to the deserts around the equinoxes. Actually that hypothesis is easy to test and see of the deserts have warmed more. Also and increased speed of the Hadley cell would also increase pressure differences and ultimately the speed of the tradewinds. Cold air at the surface of the Earth comes down from the polar regions and then the air at the polar regions is replaced by the upper air from the atmosphere. It is this descending air from the polar regions that is warmer than what it was before the current Global Warming problem, IMO. If you check again, you see that this warm air descends already around the equinoxes, causing desertification over there. The heat transport from there to the poles is much more complex, partly because there is a lot of equinox area air and a very small pole. Meanwhile, the conference has been, see here. -always be accurate and honest and completely open, not even a rounding up of an important figure. -no matter how frustated by the warmaholic terror, refrain from fallacies, you don't need them. Smart people can distinguish between science and witch hunt. Whoâ€™s on the fringe of scientific consensus? The alarmists, or the skeptics? Former Vice President Al Gore has said repeatedly that there is a â€œconsensusâ€� in favor of his alarmist views on global warming. And of course, heâ€™s not alone. Two weeks ago, Jim Martin, executive director of the Colorado Department of Public Health and Environment, when told of our conference, said, â€œYou could have a convention of all the scientists who dispute climate change in a relatively small phone booth.â€� (Denver Post, February 12, 2008). We have with us, tonight and tomorrow, more than 200 scientists and other experts on climate change, from Australia, Canada, England, France, Hungary, New Zealand, Poland, Russia, Sweden, and of course the United States. Science is no democracy and even if all tenthousand signers of that last petition had showed It's not a voting contest. Don't appeal to consensus. It doesn't change the truth a bit. The alarmists in the global warming debate have had their say--over and over again, in every newspaper in the country practically every day and in countless news reports and documentary films. They have dominated the mediaâ€™s coverage of this issue. They have swayed the views of many people. Some of them have even grown very rich in the process, and others still hope to. That's also completely irrelevant, of course in the mainstream, you can make your money honestly. You can't picture them as greedy villains like the other way around. So it's double wrong, and will likely backfire. The melting icecaps is real evidence. Here in the US, cold air comes down from Canada periodically as the weather changes. The Equinox's happen every six months. How can you mention them regarding weather that changes every 1-3 days? Annual weather changes occur from the slant of the Earths orbit. I am sure you know that. But of what? if it rains, the streets are wet. Now, is a wet street evidence that it is raining? Receding ice means that the ablation exceeds the supply. So evaporation/melting is stronger than the snowfall. On most of the high altitude ice caps temperatures are 30-40-50 degrees minus. That's too cold to snow. The air cannot hold enough moisture, now if it was to get 10 degrees warmer to 20-30-40 degrees minus then there would be a lot more snow. Hence we could easily say that global warming should cause the icecaps to grow. But if we are convinced that 'ice caps' are melting due to global warming, does that proof what causes that global warming? would any other form of temporarely warming climate in the many cycles, not be able to cause the ice caps to melt or to grow? Well there are several more variables to deal with, the ocean for instance, I think the major climate driver. That world leaders reject the views expressed by the United Nations Intergovernmental Panel on Climate Change as well as popular, but misguided works such as "An Inconvenient Truth." Your closing statement here is ignoring other problems regarding this conflict. This problem is just one aspect of other problems between the opponents (industry verses people) like 'dirty air' (ashma sufferers), distribution of wealth (rich getting richer- poor getting poorer), destruction of Natural habitats for the animals and etc. I know this is off topic but I have to include this because the opponents of GW are the wealthy industrialists that couldn't care less about what they do to the planet and the environments (deforestation). If afraid you are hopelessly confusing science with politics. I'd probably the first to admit that it would be so very very convenient if "global warming" was to be true. Everybody except those greedy folks would be happy. Science is not about political correctness, it is just about how things work. It's also about keeping checking if we are really right, when we think we know how things work. Best we could do is sort out what is really going on. I am Polish and a follower of Nicolaus Copernicus who I consider the founder of todays 'modern science' with his Heliocentric Theory. Of course there was a Greek Scientist (cant recall his name) who came up with the same theory but his was over shadowed by Aristotles Science at that earlier period.